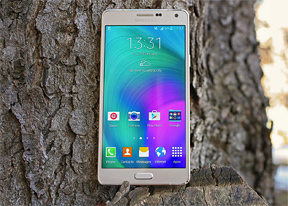 The Samsung Galaxy A7 comes with both the stock Android browser (heavily customized by Samsung) and Google's Chrome. Both support multiple tabs (including incognito ones) and an option to go straight to the desktop version of a page. S Planner is the default calendar. It features five different views: daily, weekly, monthly, yearly and agenda. The Month and agenda view uses a split-screen interface to conveniently show all events on a given day, for any day of the month. Multiple online calendars are supported, complete with color coding. My Files sorts files by their type (video, document, downloaded files etc. ), but can browse the internal and microSD storage in full. There's built-in support for Dropbox too, which simplifies handling files in the cloud. Aside from the Google Play store you get Samsung Galaxy apps - the store for exclusive content for Galaxy smartphones. Much like Amazon, Samsung is pushing its own app store with free promos.